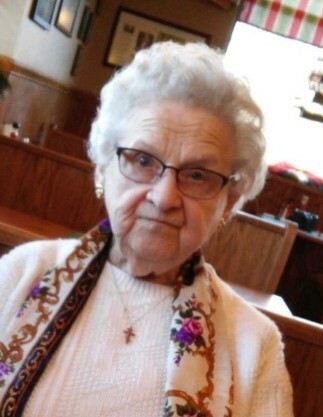 Helen Martier (Midzianowsky) of Moon Township, formerly of Ambridge, passed away on Saturday, April 6, 2019 at the age of 95. She will join her loving husband Michael C. Martier at the National Cemetery of the Alleghenies. Family and friends will be welcomed on Wednesday from 2-4pm and 6-8pm in the Sanvito Funeral Home, 1316 4th Ave, Coraopolis. Parastas will begin at 7:30pm on Wednesday in the funeral home. Additional visitation will be on Thursday from 9am until the time of service at 11am in St. Vladimir Church in Ambridge. Everyone please meet at the church. Interment to follow at the National Cemetery of the Alleghenies at 1:30pm.